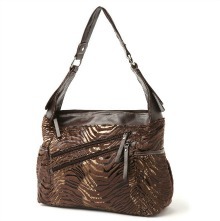 Soft, faux fur fabric in Zebra Animal print gives this hobo handbag its designer look. The zipper closure at the center opens up to pockets, zipper compartments and credit card slots inside. Additional zippered compartments on front, as well as pockets on the sides. Catherines accessories are made to accommodate the needs of the plus size woman..